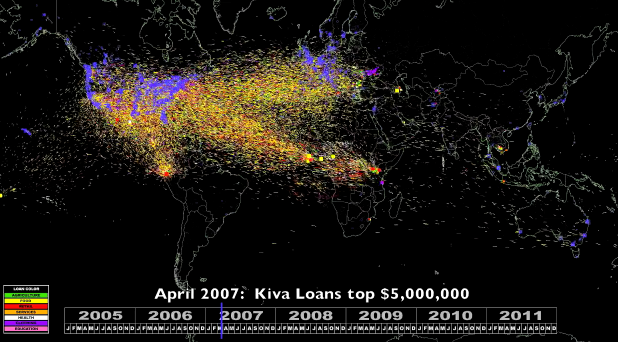 Microlender Kiva just released this video called ‘Intercontinental Ballistic Microfinance,’ which charts the donors and recipients of five years worth of microloans using their lending platform. The video visualizes data in different colors to represent different loan types, such as agriculture, education, food, health, retail and services. More than 620,000 lenders have funded more than 615,00 borrowers since 2005, with $240 million changing hands. Kiva microloans can be very small sums, as low as $20 in some cases, and enable the recipients to buy a mobile phone, for instance, and charge a nominal markup to their community for the ability to place calls. While the amount of the loan and the purchase may seem insignificant, the money can make a huge difference for desperately poor people around the world. And because it’s a loan paid back with interest, the loans go to people who want to start small enterprises, and lack startup capital. Kiva is not charity. At first glance, it’s easy to see bright clusters of lenders and recipients, starting in the U.S. and Western Europe, with money traveling to Equitorial Africa, and East Africa, as well as parts of South America. But the as time moves on, the velocity and distribution of lending activity has spread to much of the developing world. In case you’re wondering, the song they chose is The William Tell Overture, by Rossini, which is a bouncy favorite. Adds a nice touch, wouldn’t you say?